This savory entrée tart gets its flavor inspiration from the best-loved BLT combo, and a prepared pie crust makes prep super simple. Unroll pie crust onto baking sheet. Arrange tomato slices in circular pattern on crust, overlapping slices as necessary to leave a 1-1/2-inch border around edge. Combine cheese and mayo; spread over tomatoes. Fold edge of crust over tomatoes. Bake 20 to 24 min. or until cheese is melted and crust is golden brown. Meanwhile, cook bacon until crisp. Cool tart 10 min. Crumble bacon. 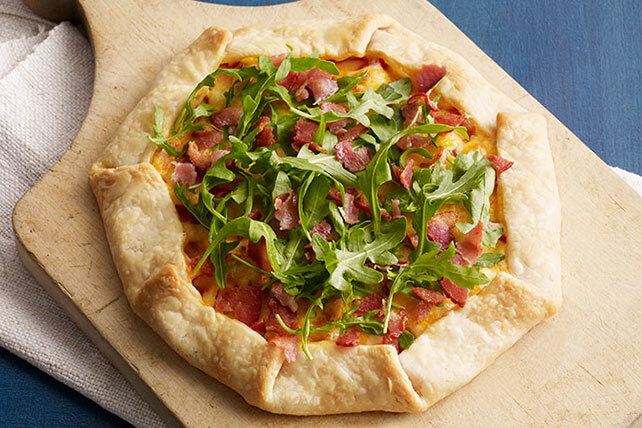 Top tart with arugula and bacon. Cut off stem ends of tomatoes. Gently squeeze seeds into bowl.